Aid agencies say anywhere from 700 to 900 migrants may have died at sea this week based on testimony from some of the 14,000 migrants who were rescued while making the perilous crossing from Libya towards Italy. ROME • A week of shipwrecks and deaths in the Mediterranean has culminated with harrowing testimony from migrant survivors who said another 500 people, including 40 children, had drowned, bringing the number of feared dead to 700. Brought to safety in the Italian ports of Taranto and Pozzallo, survivors yesterday told refugee agency UNHCR and Save the Children how their boat sank last Thursday after a high-seas drama that saw one woman decapitated. "We'll never know the exact number, we'll never know their identity, but survivors tell that over 500 died," UNHCR spokesman Carlotta Sami said on Twitter. 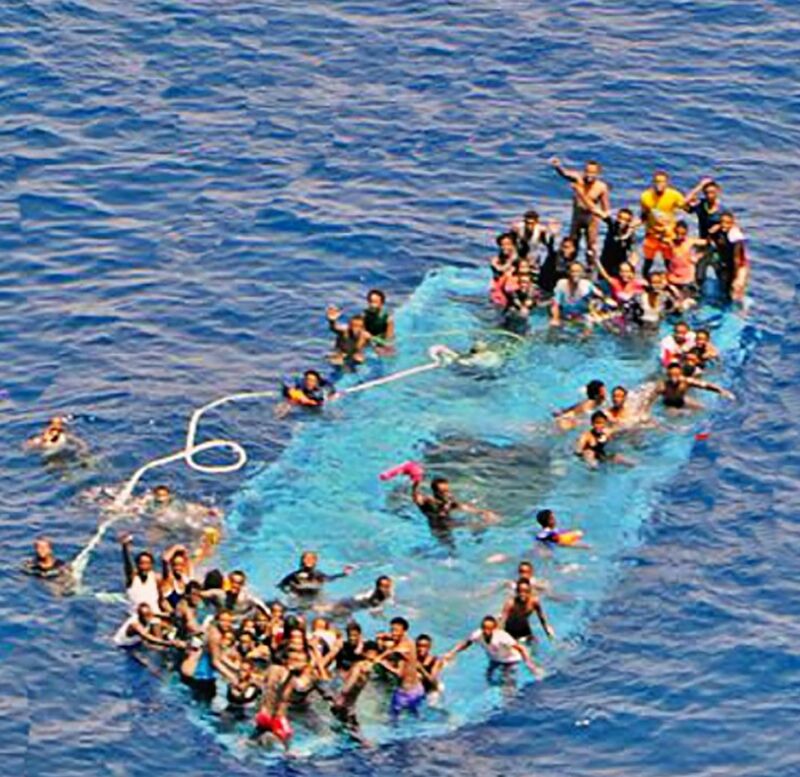 With some 100 people missing after a boat sank last Wednesday, and 45 bodies recovered from a wreck that occurred last Friday, UNHCR said it feared up to 700 had drowned in the Mediterranean last week. Save the Children spokesman Giovanna Di Benedetto said survivors of last Thursday's wreck spoke of around 1,100 people setting out from Libya the day before in two fishing boats and a dinghy. "The first boat, carrying some 500 people, was reportedly towing the second, carrying another 500. But the second boat began to sink. Some people tried to swim to the first boat; others held onto the rope linking the vessels." Survivors said the Sudanese captain of the first boat cut the rope, which snapped back and decapitated a woman. The second boat quickly sank, taking those packed tightly into the hold down with it. The Sudanese was arrested on his arrival in Pozzallo, along with three other suspected people traffickers, Italian media reports said. We tried everything to stop the water, to bail it out of the boat. We used our hands, plastic glasses. For two hours, we fought against the water, but it was useless. It began to flood the boat, and those below deck had no chance. Women, men, children, many children, were trapped, and drowned. "We used our hands, plastic glasses. For two hours, we fought against the water, but it was useless. It began to flood the boat, and those below deck had no chance. Women, men, children, many children, were trapped, and drowned," she said. Those who survived told mediators the dead included "around 40 children, including many newborn (babies)", La Repubblica daily said. "I saw my mother and 11-year-old sister die," Kidane, 13, from Eritrea, told aid organisations. "There were bodies everywhere." A bout of good weather saw a fresh stream of boats attempting the crossing from Libya to Italy. Italian news agency Ansa said some 70 dinghies and 10 boats had set off in the past week. The chaos in Libya has been exploited by people traffickers. Migrants told La Repubblica that a new "head trafficker" called Osama had taken control of departures from Libya's beaches, offering "cut-price" deals of €400 (about S$615) to lure in new customers. "I was held captive for six months in a basement of an abandoned building in Sabratha. I saw many people executed; those who tried to escape were killed by the guards," a Nigerian migrant told the daily. European Parliament president Martin Schulz said in an interview with the daily yesterday that Italy's "migration compact" idea was "the best proposal so far" for stopping the crossings and avoiding deaths. Italy wants to persuade African nations to help close migrant routes to Europe and take back some of those arriving via Libya in exchange for increased aid and investment. Meanwhile, the British coast guard said it rescued 19 migrants yesterday from the English Channel after their inflatable boat began to take on water. They were taken to the nearby port of Dover, said the Home Office. Thousands of people looking to reach Britain have been massed in northern France for months.